Should I be performing situps or crunches throughout my pregnancy? Women should avoid exercise in the supine position after the first trimester. Such a position is associated with decreased cardiac output in most pregnant women. Because the remaining cardiac output will be preferentially distributed away from splanchnic beds (including the uterus) during vigorous exercise, such regimens are best avoided during pregnancy. Up until that time, consider crunches until you abs are conditioned enough to support your spine during situps or any other hip flexor movements such as leg raises. Also consider other ab exercises performed in an upright posture, such seated or standing crunches on a cable and lever machine. Hanging or Vertical Leg Raise movements are generally more advanced. 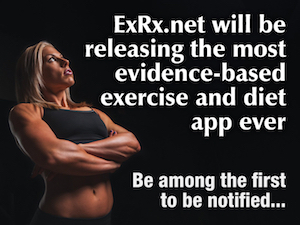 Consult with your physician regarding your exercise program. Congratulations and good training. I'm 15 but have no specific training regimen. Will bodybuilding stunt my growth? I'm fairly short but I know I'll still grow but I'd rather not risk my height for muscles I can gain later. My legs are fairly large 22" calves are 16" my upper body is puny I have no delts, traps you name it I would love to have huge lats especially. My apology for asking I know you're not the internets sports physician but I don't think I could get excellent help except from you, look at the experience you have gained and the information on your site! Weight training will not stunt your growth unless you damage your growth (Epiphyseal Cartilage) plates. This is rare and will not happen if you follow a sound exercise program. To be safe, avoid one rep maximum lifts for now and check your ego out at the door; follow sound progressive weight training practices. See weight training guidelines. Certainly, you can concentrate on your upper body but realize squats and deadlifts are exercises that can significantly increase the production of testosterone in men, a muscle building hormone, for overall muscular development. Also see Weight Training for Youth. Gentlemen, I thank you for your site - it's really helping get back into shape after a long time and I'm feeling better for it!! I would like your opinions on kids and weight training. My 8 year old daughter sees me working with the weights and would like to do some too. I've let her use the lightest weights (5 pounds) and some basic exercises including push ups and sit ups (legs, arms) and a few minutes on the bike. I don't want to send her away because I would like to keep her interested so that she appreciates her physical well being but as a growing child, I don't want her to push too hard to damage anything. Perhaps you could add a section on your site for kids. I thank you in advance for your response. In the early days, orthopedic physician's expressed concern that weight training would pose a risk to these structures in youth. Later scientific studies failed to substantiate these claims and even suggested resistance training can improve joint integrity. Damage to epiphysis (growth) plates is possible during severe trauma, but extremely rare with weight training. She will be much more likely to incur an injury during other activities and sports, particularly if she does not perform regular conditioning exercises, including weight training. Your daughter can use more resistance with little danger, as long as the workloads are progressive and time for adequate adaptation is permitted. It has been demonstrated that young children can perform weight training with little chance of injury. In fact it can help decrease risk of injury, particularly if your child participates in sports. A repetition range of 10-15 reps is generally recommended for pre-pubescent youth. ACSM even suggests a repetition range of 8-12 reps for children, but never a weight so great that they would be unable to perform at least 6 repetitions. However, many youth have even participated safely in Olympic-style weightlifting under proper coaching. Its actually much safer than many traditional sports, even for young athletes. See Injury Potential of Weight Training. In any even, the children wishing to engage in weight training should demonstrate adequate behavioral maturity. Adult supervision is always recommended. See our article on Youth Weight Training. There we have several titles that give suggestions for youth as young as 7 years of age and on up. Your website is excellent. I am hoping very much that you can help me. I am a 38 year old man. I am in pretty good shape. I am 5 foot 10 in, 160 pounds. I injured my lower back at work 4 months ago. The doctor said I have a herniated disk in L4/5. I am going to physical therapy. They use TENS and heat. It is not helping. I have pain every day. I have a very hard time bending to pick some thing up. My pain is worse in the morning when I get out of bed. I am very stiff. I was reading your information about the lower back. Would the Stiff leg Deadlift and Squats help me or hurt me. Can you please make me up a quick routine for my lower back. I have been in pain for 4 months. I want to help myself and get better. Any help would be greatly appreciated. I would strongly recommend you listen to our audio interview with Dr Brian Nelson, MD. Find the link included to the Physician's Neck and Back Clinics to obtain the following journal articles (listed below). His peer reviewed outcome studies are extraordinary compared to other therapies. Read these papers and share these peer refereed articles with your physician. If your doctor does not seem to be helpful, you should ask to be referred to a specialist such as an orthopedic physician or sports medicine doctor. Although the articles suggest a more aggressive treatment than what is typically prescribed by mainstream therapists, I suggest to stay away from squats and straight or stiff leg deadlifts at this point. Understand the treatment of lower back pain is a controversial and debated issue. Also understand that I cannot legally prescribe therapy for a specific injury since this a considered a medical issue. In the US, only a license physician can legally do that. Good luck and let me know how it is going. Nelson, B.W. (1993). A rational approach to the treatment of low back pain. J Musculoskel Med, 10(5), 67-82. Nelson, B.W., O'Reilly, E., Miller, M., Hogan, M. Wegner, J.A., Kelly, C., (1995). The clinical effects of intensive, specific exercise on chronic low back pain: a controlled study of 895 consecutive patients with 1-year follow up. Orthopedics, 18(10), 971-981. I am a 67 year old male. Both my shoulders have been "frozen" through accidents. Every few years they start to freeze-up again. Is there a set of daily "movements", as opposed to painful exercises, to keep the joints limber and prevent future freezes? An examination by a qualified health care provider is required for proper diagnosis and rehabilitation prescription. Ask your general physician for a referral to see an orthopedic surgeon or physical therapist to prescribe therapy exercises. Should we be using the or the ACSM Risk Stratification Method for screening Participants or is the PAR-Q adequate? The PAR-Q or the Exercise Participation Questionnaire would be considered the minimal standard for entry into a moderate-intensity exercise program (40-60% VO2 max). The ACSM and ACE suggest this type of questionnaire can be used as pre-participation health appraisal in a non-medical setting. I noticed you work in a medical setting. The ACSM, AHA, or AACVPR would offer a more comprehensive screening questionnaire. You may choose to use the Modified ACSM Risk Classification Calculator which can be used in conjunction with a comprehensive Medical History Questionnaire. The ACSM urges the pre-participation health appraisal be both cost-effective and time efficient, so unnecessary barriers to exercise can be avoided (ACSM, 2001). I have a question concerning the low volume training article on your site. It is very appealing to me as I am familiar to Dorian Yates' training technique. I am curious, however, about warm-up sets. Is it recommended to to do a warm-up set of 50% prior to every exercise you do? An example would be for back/bicep day. Would I need to do a warm-up prior to every bicep exercise? I am somewhat confused on that issue. It seems I could induce overtraining that way, but wanted to find out your opinion on the matter. I believe it was Arnold Schwarzenegger who advocated the use of the warm up set, citing he once foolishly thought he was too advanced for a warm up set, until he hurt himself. I personally perform and recommend a warm up set before every exercise. Not only are you warming up those specific muscles used in the exercise, but you are also warming up the joint structures in the exact mechanics unique for that particular exercise. In addition, the warm up set can give you an opportunity to rehearse your motor skill on that specific exercise, ideally, allowing you to perform the subsequent set(s) in better form. In any case, the warmup set is so light it would pose a relatively low risk in overtraining. It will, however decrease the chance of injury and prepare the body to work at a greater intensity during the workout set. Now, what would more likely increase your chances of overtraining is performing multiple warm up sets on the majority of your exercises over a period of time. If the subsequent exercise is even slightly different in the mechanics and the involvement of the assisting muscles, certainly perform a warm up set for that next exercise. If the exercise is very similar, sure, you could probably get away without performing an additional workout set with little danger. Though, I would question the use of performing such similar exercises within the same workout, particularly if your concern is to avoid overtraining by abbreviating your workout. There must be something about the angle of the grips for the lever triceps extension and lever preacher curl because there is discomfort in my elbows when doing both these exercises that I don't experience when using barbells, dumbbells, or cable. Since I am unable to directly observe your form or examine these machines, I can only make some suggestions you can look at during your next workouts. Make sure the pivot points of your joints are aligned with the fulcrum of the lever. This alignment can be more forgiving if your machines have an accommodating lever to compensate for any misalignments. Make sure your seat is adjusted so the back of the upper arm is parallel to the arm pad. You could experience more stress in the joint if these settings are off on these machines. Also if the machine permits, experiment with placing a slightly wider or narrower grip to determine if the discomfort is better or worse. As with any new exercises, maintain very strict form at a slower repetition speed, particularly when just getting used to or coming back to an exercise you have not performed for a while. Perhaps, in this case, you could consider lightening the weight 10 or 15 pounds for the first week, so your joints may have an opportunity to adapt. On the lever preacher curl (or other preacher curls for that matter), it is important to go throughout the full range of motion from the very beginning, allowing the joint and tendons to adapt. Some people, mistakenly do not go through full range of motion (ie failing to extend the elbow straight at the bottom). Later, they may inadvertently go through the fuller range of motion and end up hurting their biceps tendon or joint; not because of the full range of motion, but because their joints and tendons never had an opportunity to adapt to the full range of motion. Likewise, make sure you are not shrugging your shoulders before (or during) the initial flexion. This again does not allow adaptation throughout the full range of motion, since the elbow is already flexed slightly when the shoulders are shrugged. Perhaps, on these exercises, you should back down to a trial weight and check your form and progress upward 5 lbs or 2.5 kilos every workout (keeping an eye on your form) until you find your workout weight. Certainly, if they continue to give you problems, you should switch to another exercise, preferably one that is still not too familiar. Also see changing weight training exercises. An In Vitro setting, a ligament can stretch quite a bit. The only ligament that can match the 50% elasticity is the ligamentum flavum. Even then, Nachemson & Evans (1968) reported, "Beyond this point, the stiffness increases greatly with additional loading and the ligament failed abruptly (reached Pmax) with little deformation. Furthermore, Butler et al (1978), observed that beyond 4%, "small force reductions (dips) can sometimes be observed in the loading curves for both tendons and ligaments. These dips are caused by the early sequential failure of a few greatly stretched fiber bundles. When sequential failure occurs, it compromises the strength of the ligaments and thus increases the instability of that particular joint. Fung (1981), goes on to add that the upper limit for physiological strain in tendons and ligaments is from 2 to 5%. Finally, Kear & Smith (1975) findings suggest that "normal activity of a tendon in vivo is subjected to less than one fourth of its ultimate stress." Butler, D.L., Groods, E.S., and Noyes, F. R.: Biomechanics of Ligaments and Tendons. Exerc. Sport Sci. Rev., 6:125, 1978. Fung, Y.C.B. : Biomechanics: Mechanical Properties of Living Tissues. New York, Springer Verlag, 1981, p.222. Kear, M., and Smith, R.N. : A method for recording tendons strain in sheep during locomotion. Acta Orthop. Scand., 46:896, 1975. Nachemson, A.L., and Evans, J.H. : Some mechanical properties of the third human lumbar interlaminar ligament (ligamentum flavum). J. Biomech., 1:211, 1968.